As the bright stars deck the sky; floating candles and ethereal earthen lamps spread a celestial glow in Haridwar that is best experienced when one actually visits the city. One of the seven holy places of India, Haridwar is also considered the oldest cities of India. The ancientness of this city is well-mirrored by the Haveli Hari Ganga hotel. The Haveli, originally built 100 years ago by the Maharaja of Pilibhit, is an architectural marvel, where the ancient structure has been restored to blend the old world charm with the effervescence of the contemporary period. Thus, capturing the essence of the bygone era and infusing it with the comfort of home, the hotel is perfect to delve in the surreal experience of Haridwar. 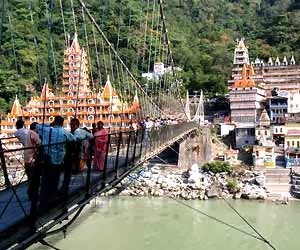 Haridwar tourism mostly consists of pilgrims and adventure travelers. These voyagers are flawlessly accommodated at the Haveli Hari Ganga hotel. A wide range of accommodation options, befitting the budget of all kinds of travelers, makes the hotel a hit among travelers visiting the city. Thus, choose from a galore of lavish Suite Rooms to economical Deluxe Rooms and retreat while relishing the lovely backdrop of the hills and greenery visible from the windows and balconies. The best part about The Haveli Hari Ganga hotel, however, is its easy accessibility from the Haridwar places to see, which are located in a small radius surrounding the hotel. Most of the places, including Mansa Devi Temple, Maya Devi Temple and Hari Ki Pauri are located just within few meters from the hotel. Thus, while visiting Haridwar is an experience that most people want to have, a stay at the Haveli Hari Ganga hotel will ensure that your visit has balanced tones of tranquility and comfort.